From pastel pencils to the softest pastels, we explore your options. A pastel is a stick of pigment that you hold in your hand, and apply directly to the surface. Like trying to choose the best pencils, it can be confusing knowing which pastels to buy, with different brands available, all with different grades of hardness and varying prices. However, after a little bit of experimentation, artists often find that they use a few different types, according to their subject matter, type of mark making, and the size of their work. Artist-quality pastels tend to have a colour range that includes deep darks, bright lights, and a range of saturated and neutral colours. So if your paintings are looking a little flat, and lacking in depth, it may be that you need to invest in some better quality pastels. But don't let price put you off. You don’t need to buy a whole set to find which pastels suit you. You can get some of each type and experiment with different subject matter, sketching or painting, rough textures or soft blending. Remember, price usually reflects quality. Hard pastels and pastel pencils are great for sketching and underpainting. They tend to be squarer in section with a high proportion of binder. Conté crayons are very hard, wonderfully versatile, and have sharp edges to give a variety of marks. Inscribe pastels are cheap, ideal for beginners, but are not lightfast. Faber-Castell Pitt Pastel Pencils produce fine, delicate detail. 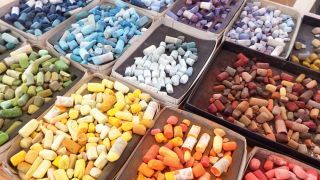 Medium-softness pastels, such as Royal Talens Rembrandt and SAA Artists Soft Pastels, have more pigment than the harder varieties. They are useful for work that requires good coverage and the pigment is not too soft, and are ideal for crisp mark-making for subjects such as animals, where fine lines and textures are needed. They tend to be round, but narrower than very soft pastels. Professional-quality pastels are made with rich, high-quality pigments, and less binder. This results in wonderful creamy textures, with a huge range of saturated colours and subtle hues. Brands include PanPastels, which are applied with sponges and tools, Sennelier and Schmincke Pastels, and Unison Pastels, which are handmade in the UK. Professional pastels cost more but are excellent value for money.